Maharajpuram C Ramachandran Carnatic Classical Music Workshop. This Maharajpuram Ramachandran lecture series will be held at the Hindu Temple of Southwest Florida. Cost to participate in the week long lecture series is $150. Additional family members pay only $100. To observe each session, but not participate is $10 for non members and $5 for members each session. Maharajapuram Shri. Ramachandran, as his name suggests, hails from the famed Maharajapuram lineage, his grandfather being the late Shri Viswanathnatha Iyer and his father the late Shri. Santhanam. He also happens to be the seventh in line in the direct Sishya Parampara of Saint Thiagaraja. This solid background has helped him earn a name for himself and carve a niche as the authentic heir of the Maharajapuram style. Strict adherence to tradition has earned him several awards and titles from prestigious sabhas in Chennai. He has been awarded the title of Sangeetha Choodamani by the Krishna Gana Sabha, Chennai in year 2007. 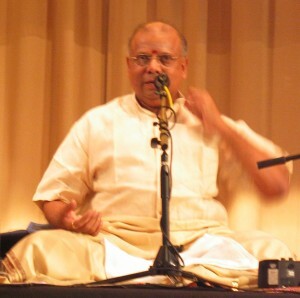 He is the Aasthana Vidwan of the Dayananda Ashram at Saylorsburg, PA. The Swamiji of the ashram has bestowed upon him the title of Aarsha Kalaa Bhushanam in 2007 at Chennai. Shri. Ramachandran, who has graced the SIMA stage before, is a Grade “A” artist of the All India Radio and Doordharsan. He was faculty of the Department of Fine Arts at the Annamalai University in Tamil Nadu. Shri. Ramachandran will be conducting a workshop at the Ashram in Saylorsburg around this time next year. Those of you who are interested, may join the workshop. Please let us know how you enjoyed this event. Really enjoyed this workshop. He is a great teacher. This music workshop was a great learning experience! Sri. Maharajapuram Ramachandran is a great teacher, who taught with patience and genuine interest in furthering our knowledge and appreciation of carnatic music. He encouraged us with positive reinforcement and made each session memorable!